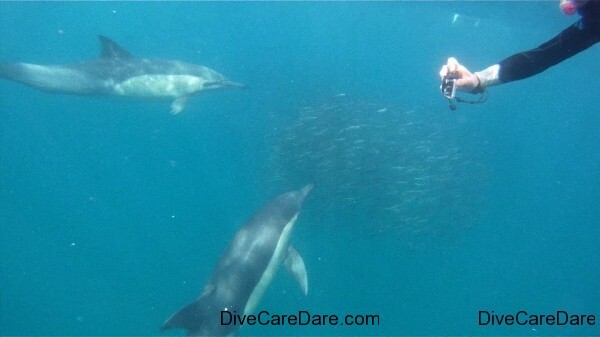 We were here in Coffee Bay with Roland Mauz and African Dive Adventures for the infamous Sardine Run. We hoped to dive on sardine bait balls with the promise of accompanying dolphins, sharks and diving gannets, but for the first day we saw mainly dolphins and humpback whales, or as Irene my wife had accidentally nicknamed them, ‘wholphins’. The whales were generally travelling quite fast. As in Queensland, Australia they are on a mission to places much further north and they usually don’t want to stop to interact with us in the water. 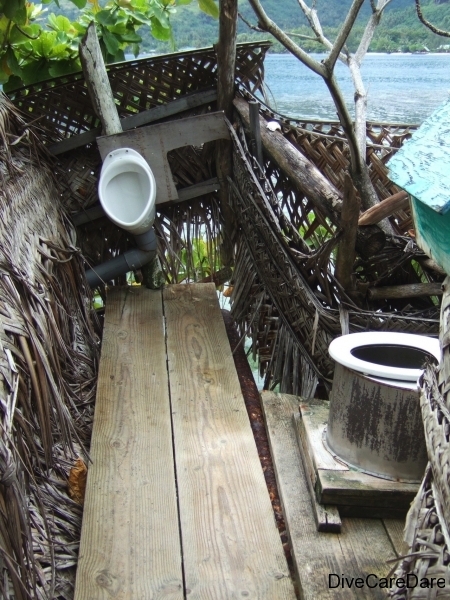 This had certainly been our experience on day one at Coffee Bay. This was day two and we were out yet again in search of the elusive sardine bait balls. The clarity of the water was better and we were all more attuned into kitting up into our wetsuits and snorkelling gear to get into the water more efficiently. The ‘eye in the sky’ was out spotting for us and indeed the ultra light plane found quite a few pods of dolphins, at times up to a hundred or more in a pod. One of these accompanied and completely surrounded some whales, and at the back of this ‘wholphin’ pod was a group of about seven dusky sharks following all the action. Some whales were having fun with breaches and tail slapping. We also saw diving and ‘rafting’ gannets, but still no sardine. Big Louis is the man. 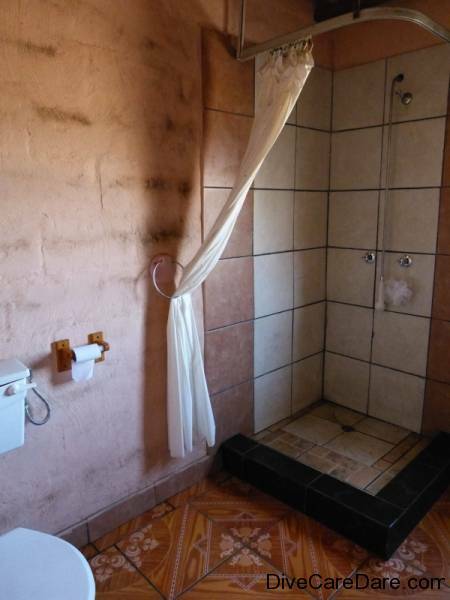 He lives in Limpopo, the northern most province of South Africa and owns a 2-stroke ultralight spotter plane, aka ‘the mosquito’. He comes down to Coffee Bay with his wife, two teenagers, yorkie and 6 week yorkie x schnauzer puppy purely for the Sardine Run. It is his third or fourth season with Roland and Beulah and they work together as a team. His mission is to be the ‘eye in the sky’ and fly all day up and down the coast around Coffee Bay in search of the sardine action for African Dive Adventure clients. 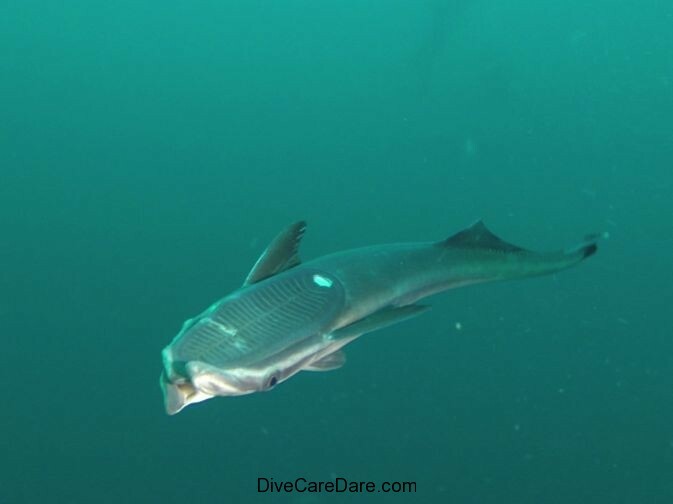 I had the pleasure of going up with him today to experience the Sardine Run from this different perspective. After a spectacular day yesterday with the best personal encounters of whale action you could ever wish for, I was more than happy to give up my seat in the boat for another kind of action in the air. 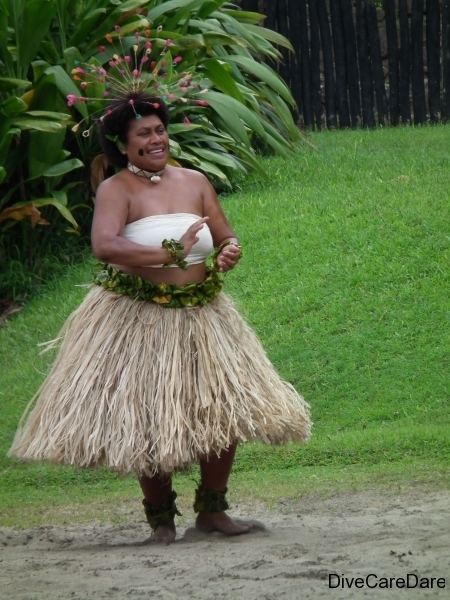 Louis kitted me up on the beach outside the Ocean View Hotel with a helmet, microphone and seat belt. I had to make sure both my cameras were securely fastened to my person. Nothing was allowed to be loose or it could fall in the water, worse still hit Louis on the head or fly into the small engine behind me and stall the plane. With that in mind and a little intrepidation, off we went. Tony with intrepidation – thumbs up! The Sardine Run is a very special natural phenomenon. The sheer number of sardines involved results in a feeding frenzy along the coastline of South Africa and in terms of biomass is said to rival East Africa’s great wildebeest migration. The Sardine Run is where shoals of sardines drift north up the east coast of Africa to KwaZulu Natal and Mozambique from the cold waters of the Cape of South Africa. These shoals can be more than 7km long, 1.5km wide and 30m deep and are very easily spotted by planes or from boats on the surface. It is usually around May-July and involves billions of sardines. They spawn in the Agulhas Bank, the southern most point of South Africa and then head north along the south east coast of Africa. The run occurs when a current of cold water heads north from the Agulhas Bank to Mozambique, where it heads out into the Indian Ocean. The Agulhas current is a warm, more northern current that pushes the cooler Atlantic southern current up against the east coast and hopefully forces the drifting sardines inshore so the run can be witnessed. The Sardine Run is all about the water temperature. It has to fall below 21 degrees to happen. Sardines need cold water and will not be seen if the water is too warm. The run does not occur every year and in the last 23 years, it has failed on three occasions including 2003 and 2006. This year the weather is quite unseasonal. Today the air temp is 25C, unheard off at this time of the year. The dive and snorkel briefing is all important as this is such an unusual phenomenon, if you do the wrong thing, you will disturb the bait ball action and it all ends for everyone. Then the search has to be repeated to find another bait ball. The Protea Banks is about 7km out of Shelly Beach and Margate, which is two hours south of Durban, on the Indian Ocean. 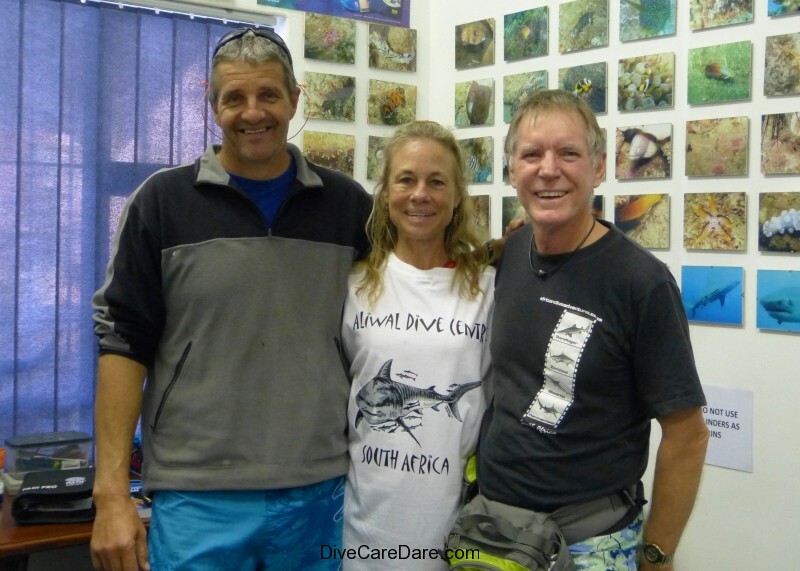 Roland and Beulah Mauz of African Dive Adventures have operated here for the last twenty years on the north and south pinnacles of the Protea Banks. 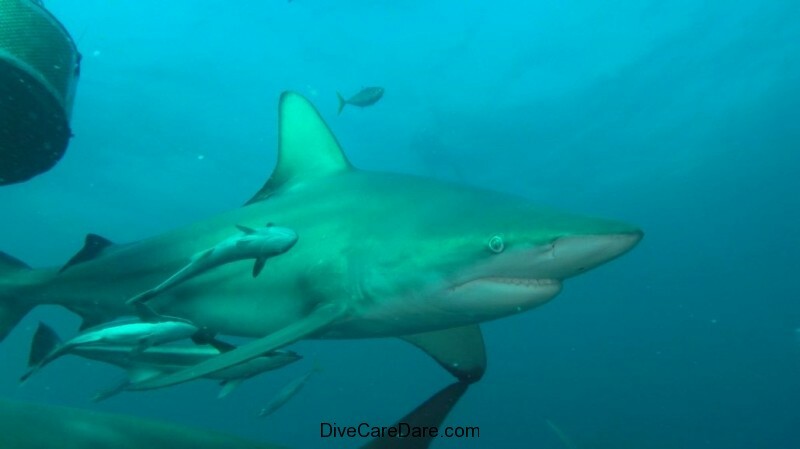 The Protea Banks are world famous for advanced, thrill seeking adventure divers, especially for cageless shark diving. They are known for their population of zambezi’s, tigers (March to June), hammerheads and others including dusky sharks, as well as 1200 species of fish as well as whales, mantas, dolphins and turtles. 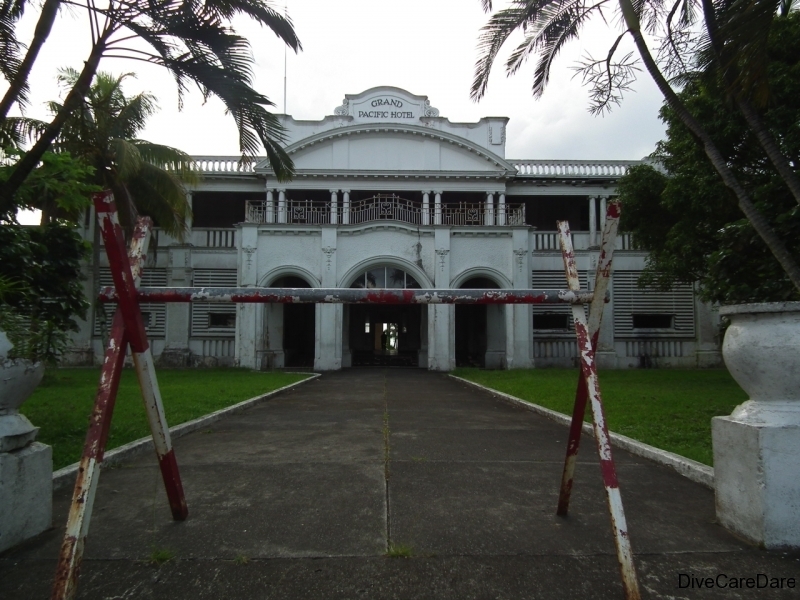 It is also the home for the ragged tooth sharks, what we know better as grey nurse sharks, a place where they often rest. Occasionally great whites and whale sharks may also be encountered. 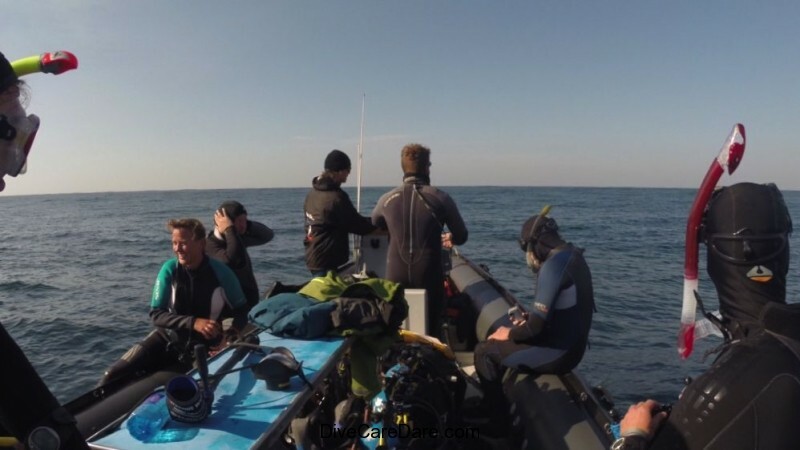 We had arranged for two dives on the north pinnacles with Roland, the first being a baited shark dive. 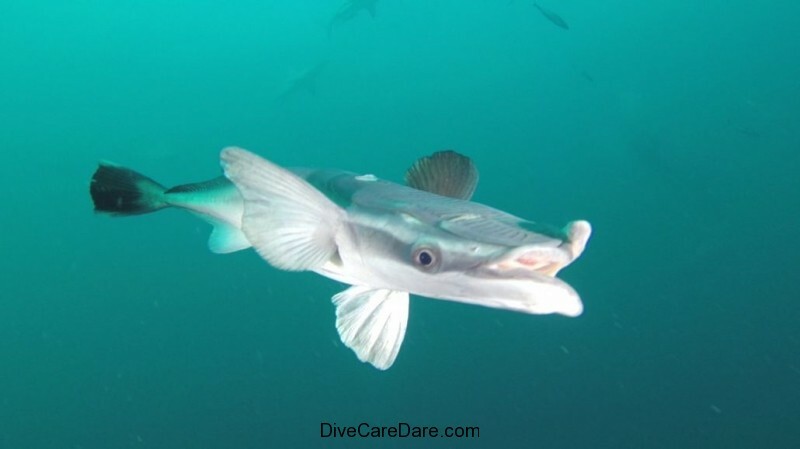 This baited dive is quite different to that offered at Aliwal Shoal as it is a deeper dive and is on a reef not a sandy bottom, so there is much more diversity to be seen. 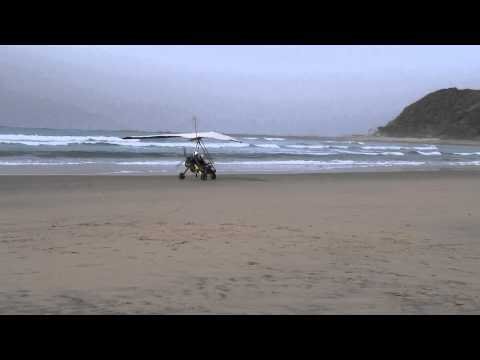 The semi-rigid inflatable dive boats are often launched from the surf beach (very exciting!) or the mouth of a nearby river. 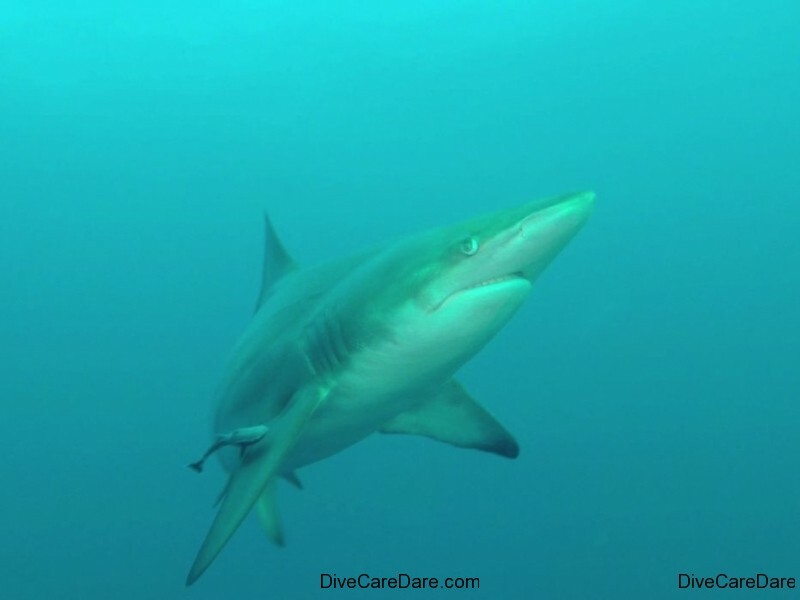 Baited shark dives have certain procedures to follow to ensure the safety of each and every diver. Instructions from the Dive Master and Bait Master need to be followed at all times, after all they have a 100% record of no injuries after more than 500 baited dives. Bright coloured fins or equipment is discouraged, and there should be no loose or drifting pieces of equipment to attract a shark’s attention. 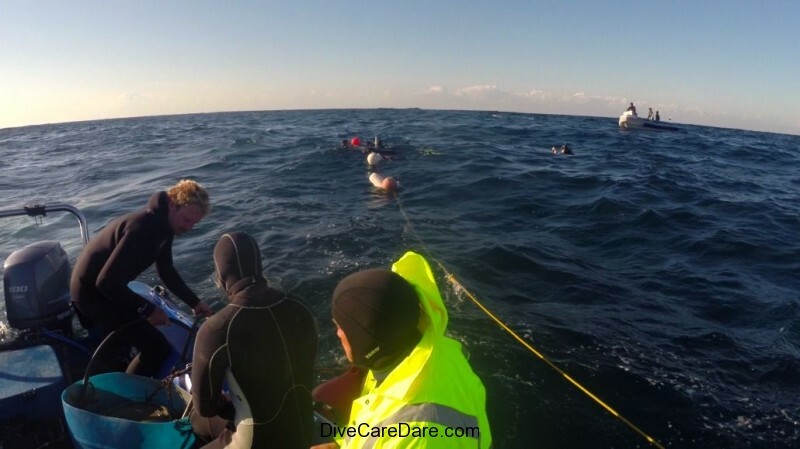 Divers are encouraged to stay as a group as if someone separates away the sharks may become more interested in them. Rapid movements or touching the sharks is a no no. 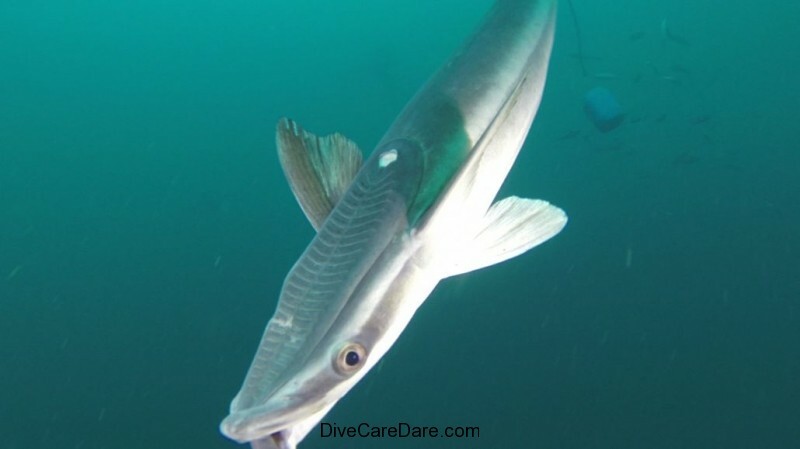 The dive is also a drift dive so you are going with the current, and for as long as you are vertical in the water and stay with your group and on the correct side of the bait scent or scum slick, you can basically be motionless in the water for an hour and a half at the designated dive depth of 5-15m. The ocean floor below you is much deeper at 30-40m. You also have to try to keep out of the chum slick or a shark may engage you by accident. Visibility on the day was such that you could see the ocean floor. The fish can often see the bait box and don’t need to smell it. A big groper, tuna, rainbow runners and a few other reef and pelargic fish also came in to feed on the tiny bits of fish coming out of the bait box. Although going out the seas were quite calm, we had a ripping wind later on that created a two and half metre wave on the surface that was popping the feeding container up and down, shaking out the contents vigorously. There was a strong current too, which pushed us eventually quite a distance south of the north pinnacle. We were in the water for an hour or so and had a handful of oceanic black tips ripping and tearing at the carcasses of larger fish in the external bait. 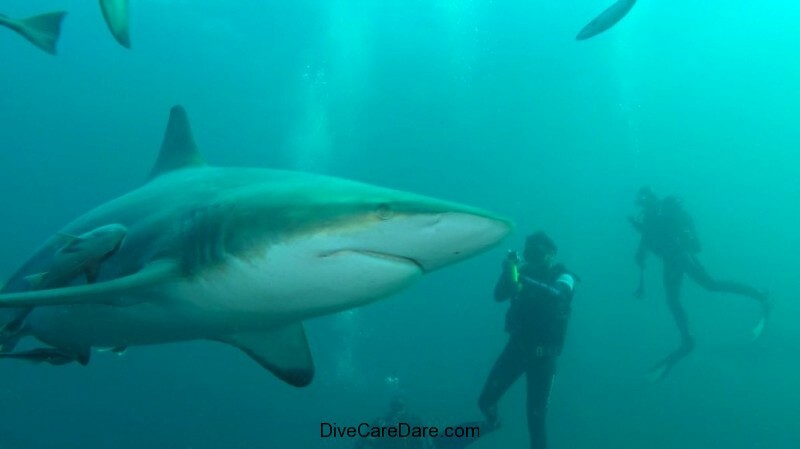 The zambezi’s or bull sharks were much more cautious and never actually came to the same level as the divers. They tended to hang around much deeper than us, and in fact when one of our divers went down to photograph them, this made them nervous and they scattered. 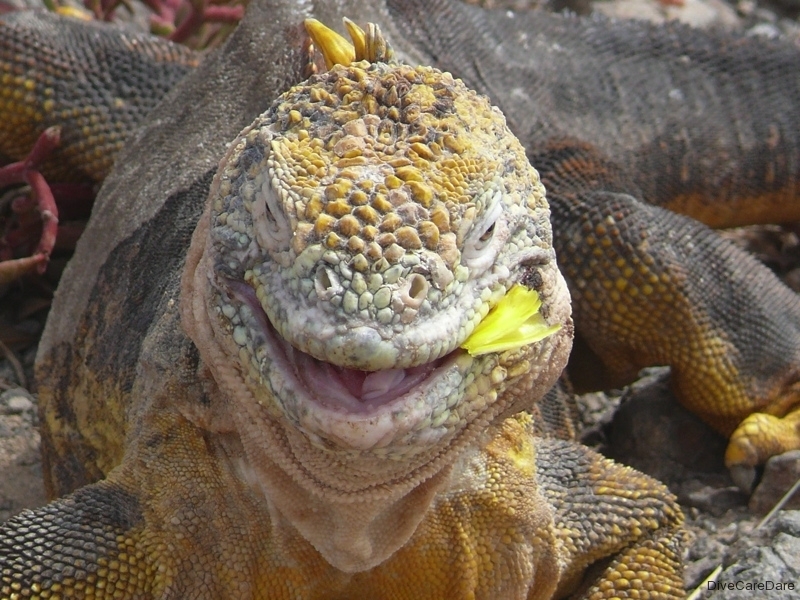 Definitely not the aggressive animal many people have the impression they are. So from that point of view there is something to listen to the advice of the Dive Master to keep away from them or you will scare them away and loose your chance and your group’s of some great photos. This first dive also encountered a productive layer near the top of the water column at 10m which meant there was a lot of plankton there. The water here was quite warm although the visibility was down to 10-15m but I took some great photos of jellies and salps that took my interest as they shone in the water column. 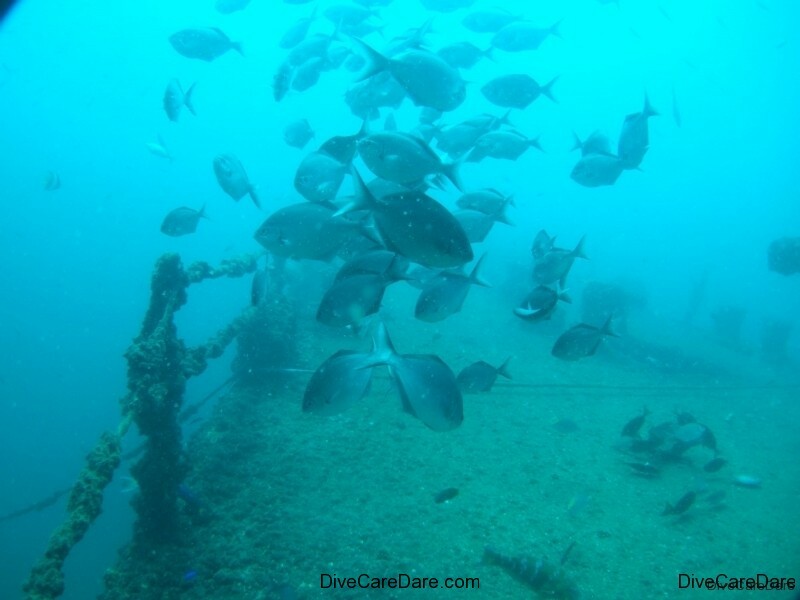 But on our second non-baited dive, at the bottom you could see as far as the eye could see, 30m or more. This was the cleanest water I had ever seen, and the reef was quite colourful despite not being a tropical reef, aided by the cloudless sky above and the bright sunlight. There were so many nooks and crannies to explore. We were down at the 35m and in one cave we found about 50 or more raggies or grey nurse sharks, with a conservative estimate of up to 200 or more all over the ocean floor, just resting in a soft wave-like motion of the water in their sleepy daylight state. 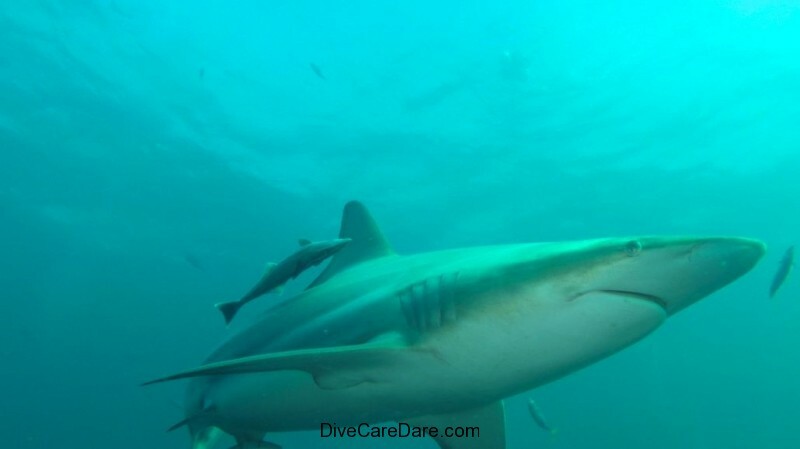 This was a real experience of one of our divers Dominic from Austria, as last year we had both had a shared experience at Wolf Rock in Queensland Australia but then had only been privileged to see 5-10 of these sharks, nothing like this. He was totally blown away by the sheer numbers of them here. We also saw many bull sharks, but these were in mid water and almost at the limit of our visibility when looking up. 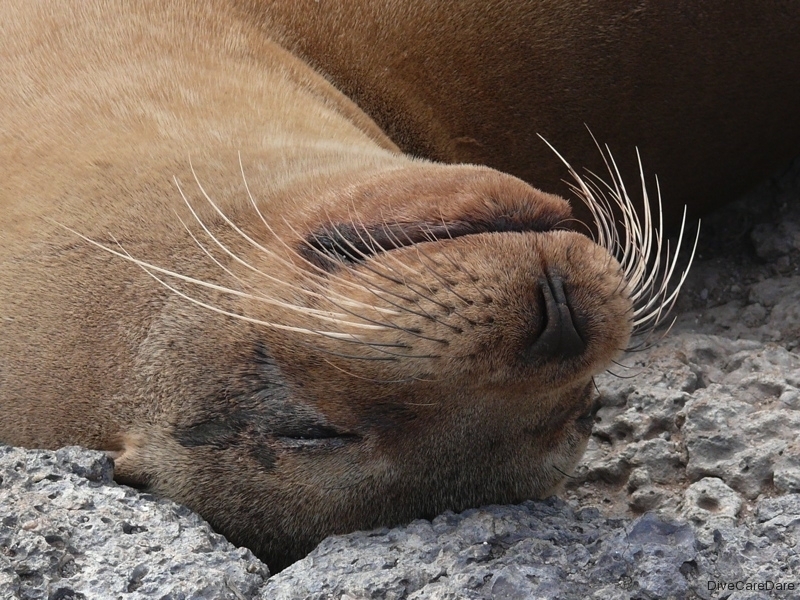 However we saw them much better on our safety stop at the end of the dive where they were just all cruising around us. In fact, if I didn’t have the attitude I have now to sharks, I would have been quite fearful of being in the water surrounded by so many of them. 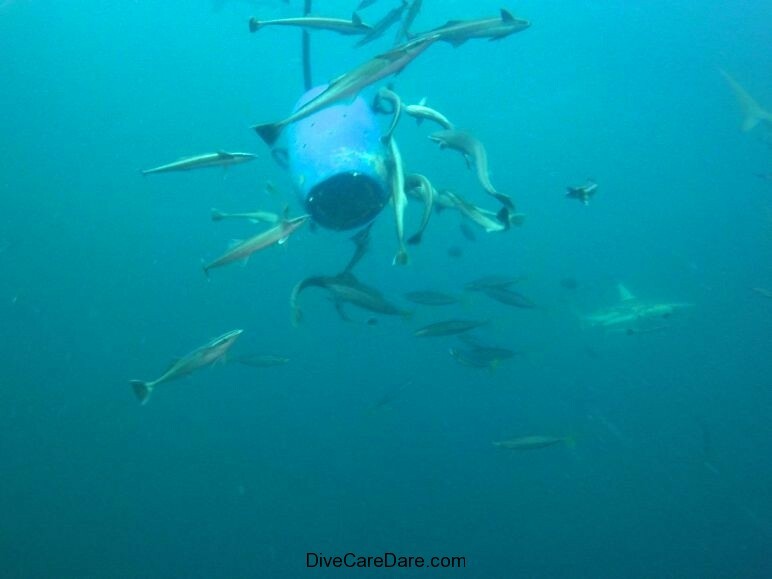 They were all around us, and this wasn’t a baited shark dive, this is just where they hang out on the Protea Banks in June to August. Coming back the seas had really kicked up and there were two and a half metre waves which dwarfed our boat. We basically had to surf them to get back into shore with yet another spectacular and thrilling beach landing, and a dry one at that. 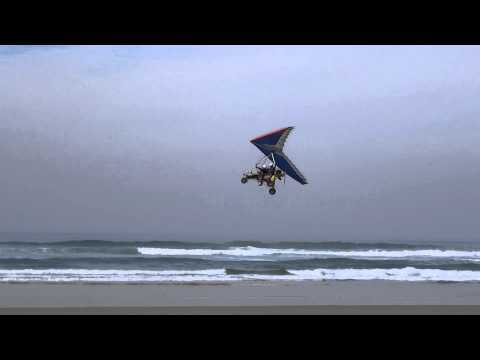 It’s quite a thrill to be flat out at full throttle and then suddenly you’re on the beach. And if you are not holding on, you’re doing a face plant! 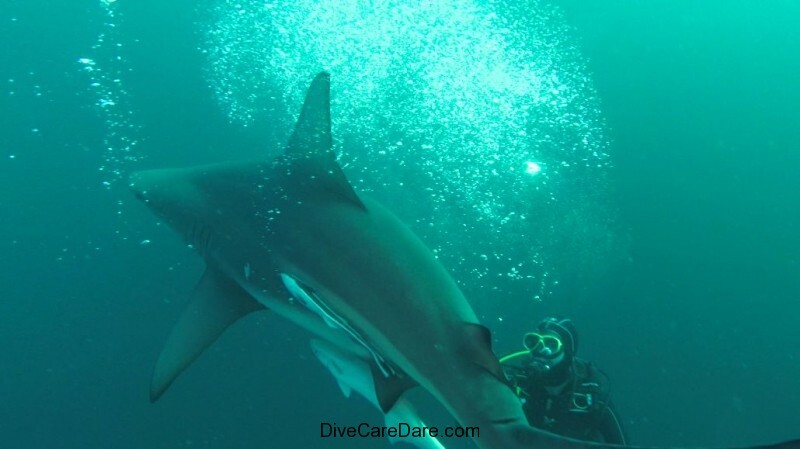 The Protea Banks is a world reknowned shark diving reef and is sure not to disappoint. 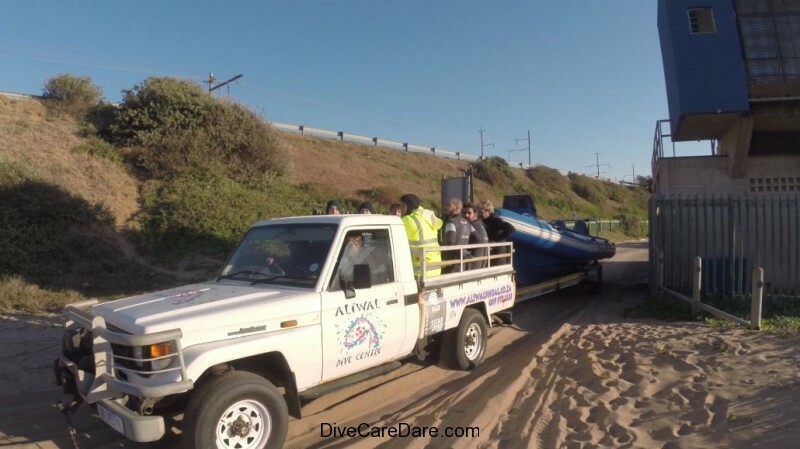 It is the mission statement of African Dive Adventures to give each and every diver the best and safest diving experience on Protea Banks and they certainly don’t let you down. 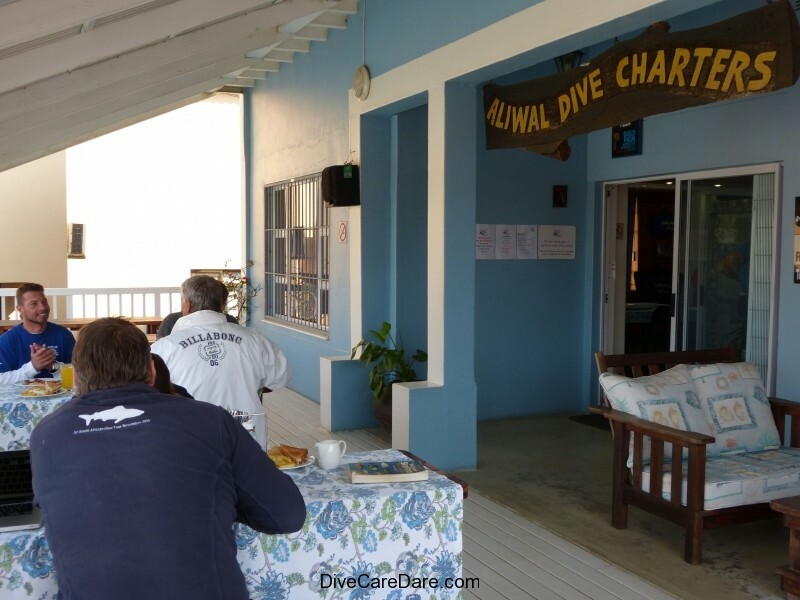 Aliwal Shoal has a reputation for giving you a cageless shark diving experience you will never to forget. Their specialty is oceanic black tips and boy, do they have a lot to share around. The reef is about 7km off shore and diving there has the reputation of being one of the top 10 dive sites in the world. The special baited shark dives are only at max of 20m deep so they offer opportunities for both scuba divers and snorkelers. 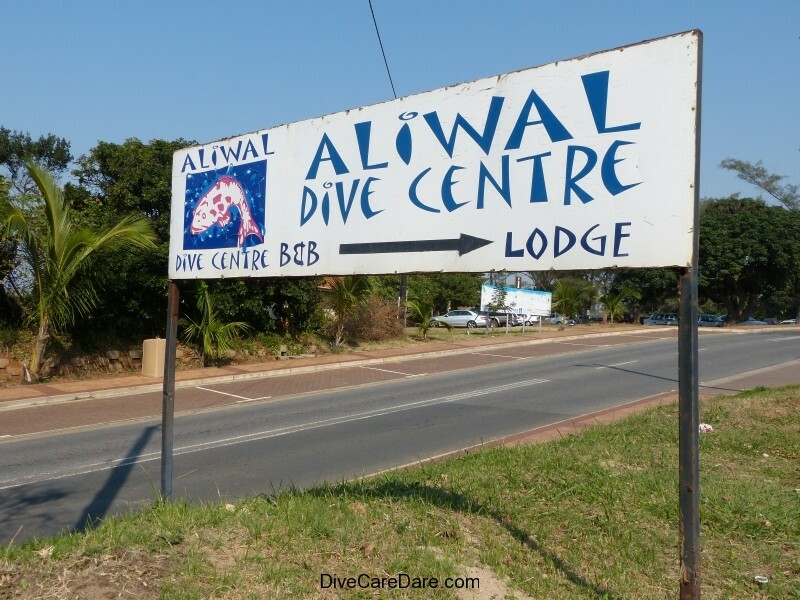 Aliwal Shoal is situated one hour south of Durban, on the east coast of South Africa on the Indian Ocean. 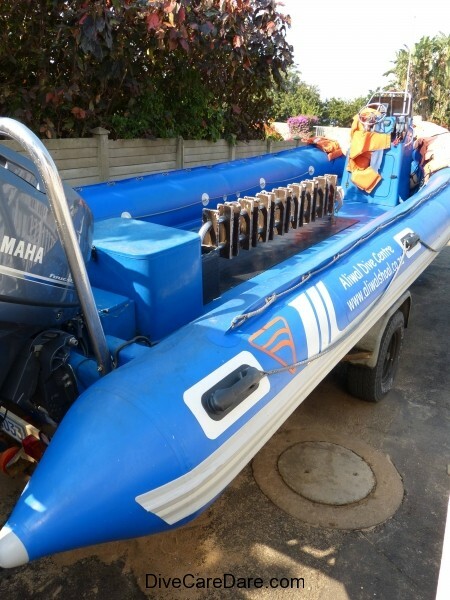 The dive boats go out of the small beachside village of Umkomaas by either a beach or nearby river launch using semi-rigid inflatable boats. 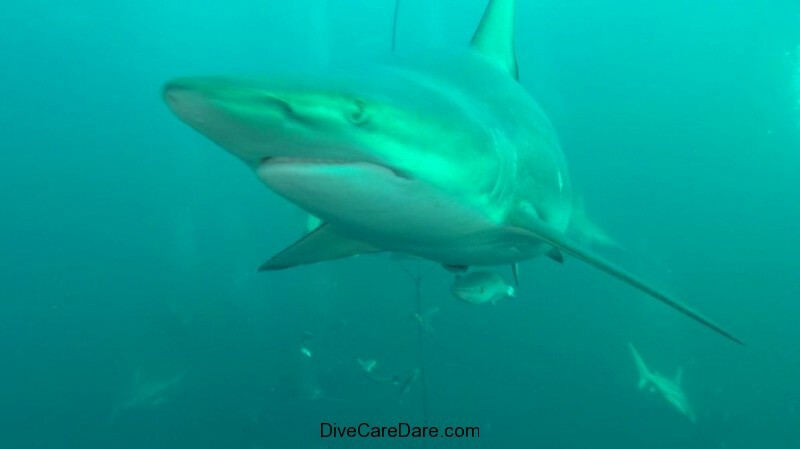 We took the opportunity to organise a single baited shark dive whilst on our way further south to Protea Banks. 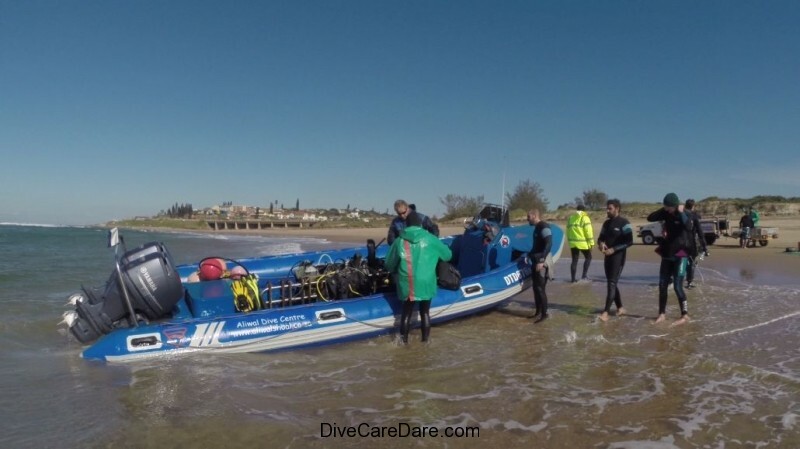 At 7am we met up with Aliwal Dive Centre’s operators Clare and Basie Ackermann on a dropdead gorgeous, 24C, blue sky day, with a water temperatures of 19-21C. We had four in our party as well as their four crew in the boat. 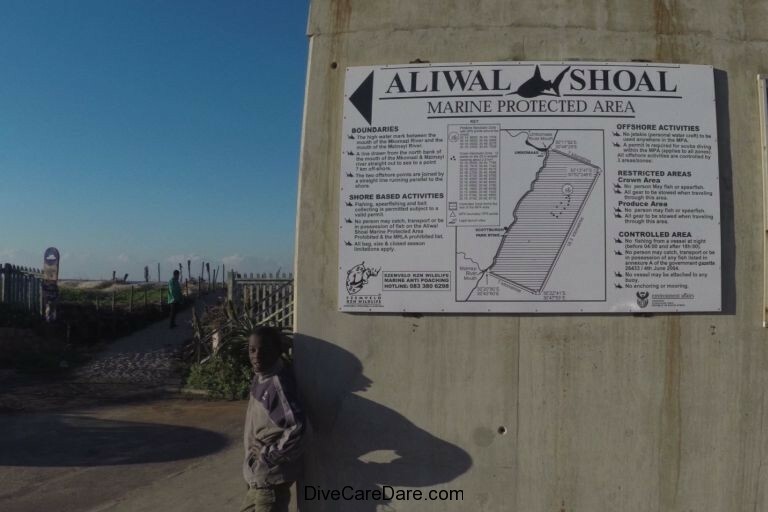 Aliwal Shoals is an amazing surf beach, which means divers get to experience a thrilling beach boat launch with a difference. Most Australian dive operators would never dream of tackling waves and conditions like these, but to the locals, this is the norm and they haven’t lost a diver yet! In fact is quite a local spectator sport watching the boats go out and coming back in to the ramp. This is only to be enhanced by the 45 degree slope on the actual boat ramp itself, adding further challenges to the whole process! 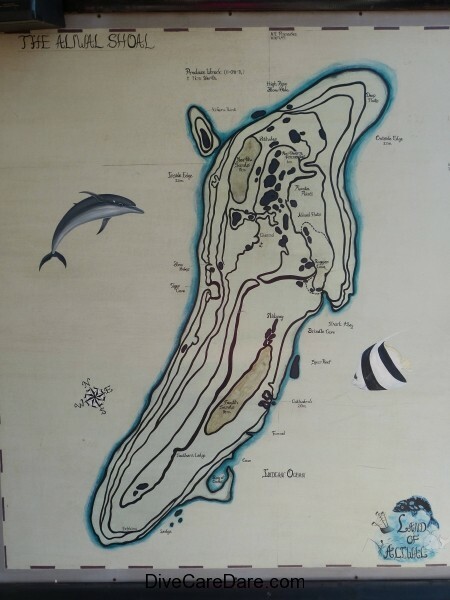 Once out of the surf breaks, it is a short 20 min boat ride to the baited shark dive site. This is not actually on the reef itself but is based on a sandy bottom, with a depth of only 20m or so and excellent visibility. 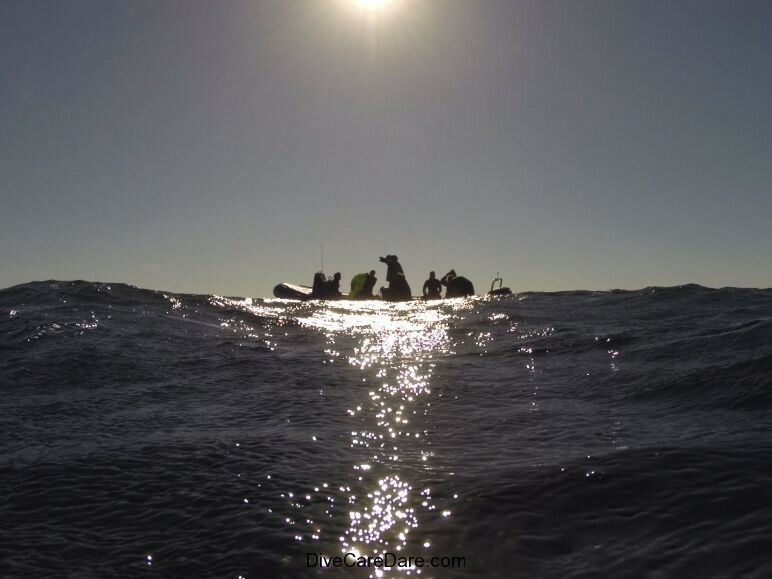 There was already another boat at the site when we arrived so we had to negotiate with them to be able to set up our bait boxes a short distance away from theirs to be able to share the sharks. The process is such that there are two bait boxes filled with local frozen fish such as pilchards. One is set about 10m deep, the other 20m deep to leave a scent or scum trail to attract the sharks. On the sandy bottom near our deep blue bait box was where the small numbers of sardines and remora ‘shark sucker’ fish generally hung out. Maybe they felt safer being down there rather than higher up where the shark population was. 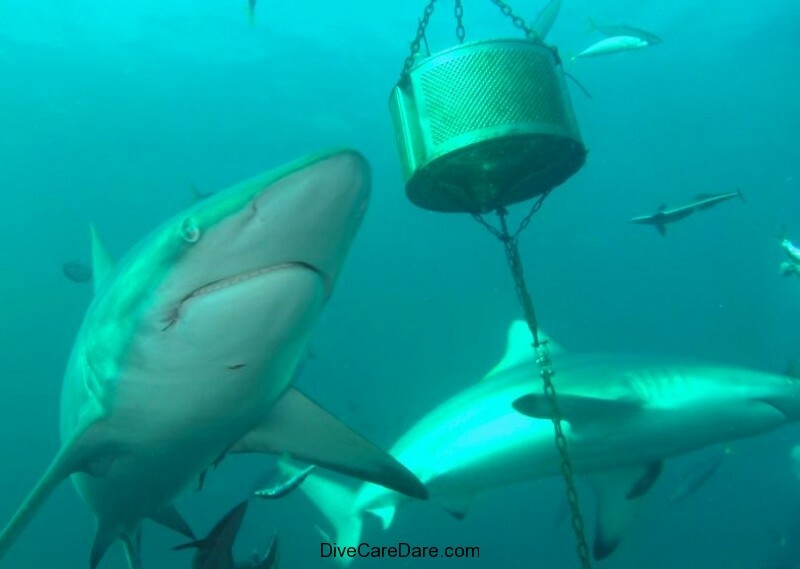 The Zambezi or bull sharks and tiger sharks tend to be attracted by the deeper box throwing the scent and then they slowly come up to the more shallow bait box. 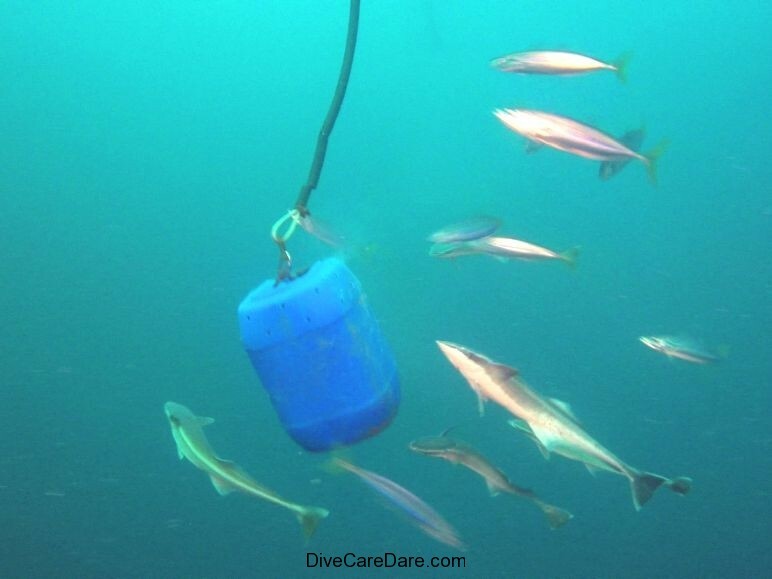 It should be noted that this is not a shark feeding dive, just a baited dive where there is only enough fish to keep the sharks interested and not enough for an actual feed, so the dive operators are not altering the natural behaviour of the sharks. When we looked and swam up we saw many oceanic black tip sharks which is what they specialise in here. 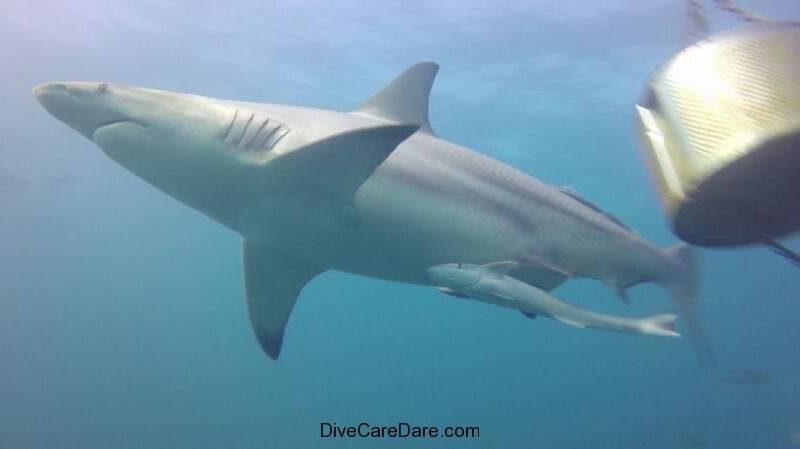 These are a sleeker looking shark with a streamlined fusiform body shape for fast manoevering in open ocean waters. They have a pointed nose and black tips on all fins. They grow to about 1.5m and are usually wary of humans so they may take 10-20mins to gain their confidence around the divers and the bait boxes. But once confident, they crowded us in their numbers. It was amazing to have so many sharks swimming around so close and to experience the thrill of seeing so many oceanic black tip sharks all in one place totally surrounding us. There would have been 40-60 sharks on our dive and we were right in the thick of it. 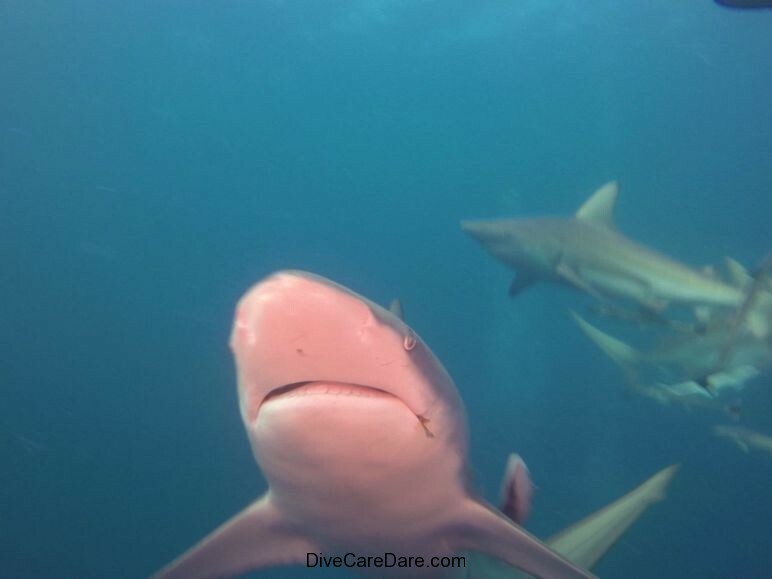 We didn’t see any bull sharks on our dive but this same dive site last week had a tiger shark which is very unusual for this time of year as the usually are seen from March to June. Oceanic black tips have been known to attack humans when there is food around. So it is only at the end of the dive when we were all back on board the boat that the operators threw the remainder of the bait fish into the water. The ‘boiling water’ and ‘shark soup’ beside the boat at the end of the dive was a spectacle in itself. There were sharks everywhere, fighting for the last morsel, often breaking the surface with the classic shot of shark fins thrashing around. The boys loved it! You couldn’t wipe the smile off their faces. To crown it all off, a loggerhead turtle swam by as we surfaced at the end of the dive. 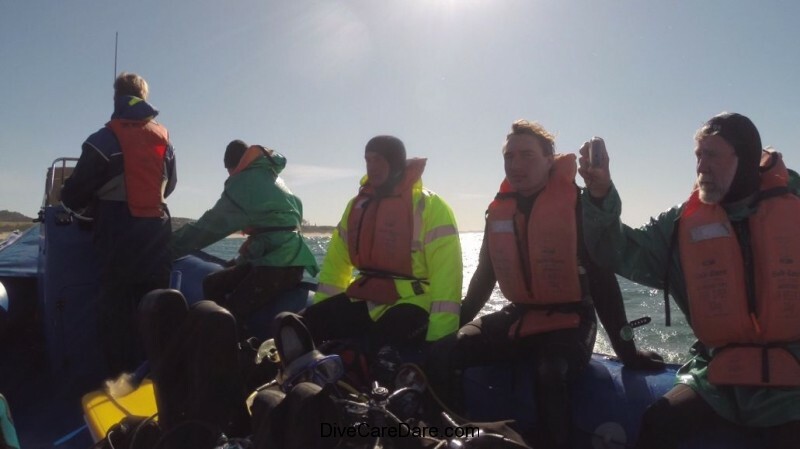 What a day, what another diving experience. 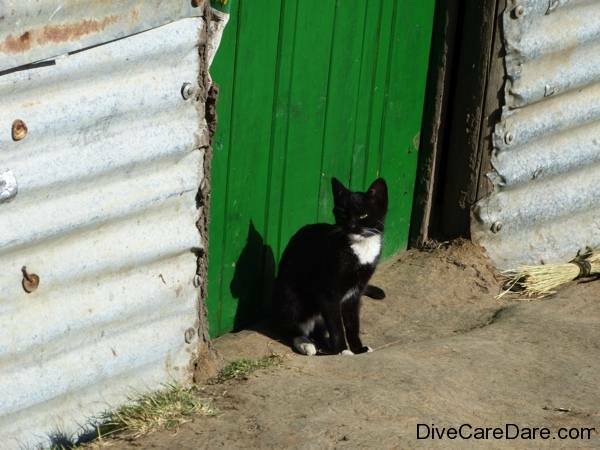 Thanks Basie, Clare and the Aliwal Dive Centre team for an African shark diving experience of a lifetime. I’m sure we will be back. 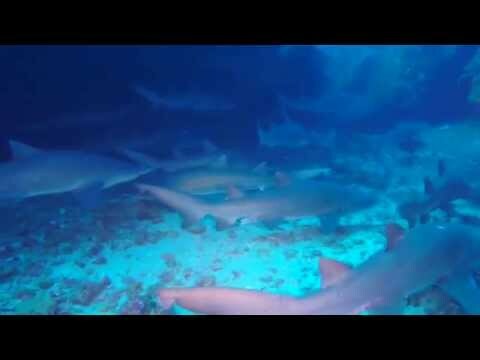 BLACK TIP SHARKS, TOO MANY TO COUNT! 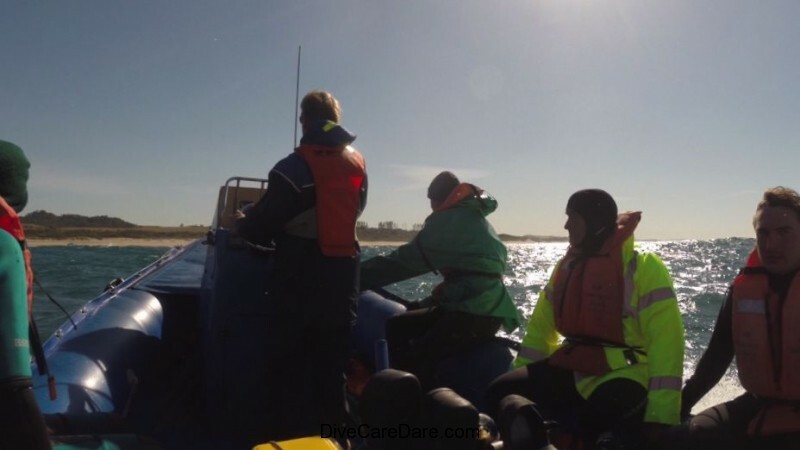 With the courtesy of Basie Ackermann and his Aliwal Dive Centre team we went out this week on a baited shark dive close to Aliwal Shoal. At 5-15m we had more than fifty black tip sharks who were tempted in by the scum slick in the water from the bait box. At times it was almost overwhelming, not one for the faint hearted to be completely surround by shark soup! 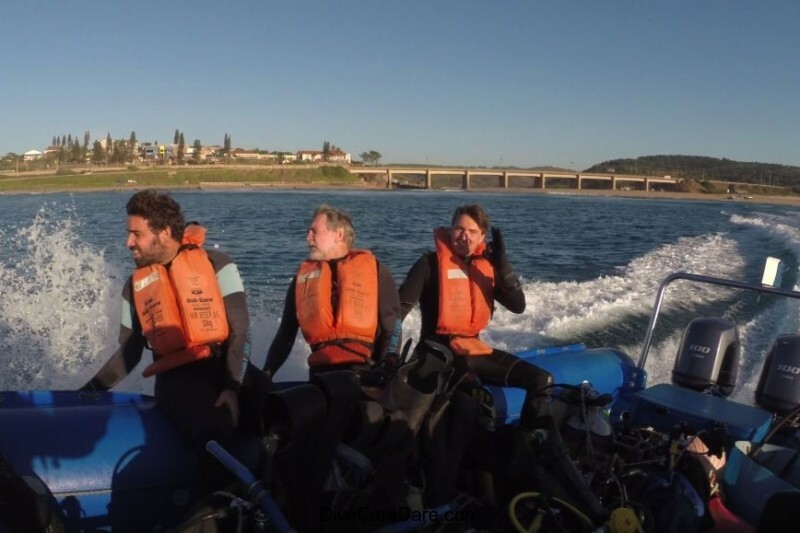 We had the privilege of going out with Roland Mauz of African Dive Adventures this week to the Protea Banks on the Hibiscus Coast, about two hours out of Durban. We were blessed with over 200 ragged tooth sharks just drifting in the gentle current on the sea floor, in their sleepy daytime state. Far different to the dive I did last week at Wolf Rock in SE QLD were I only saw one shark! 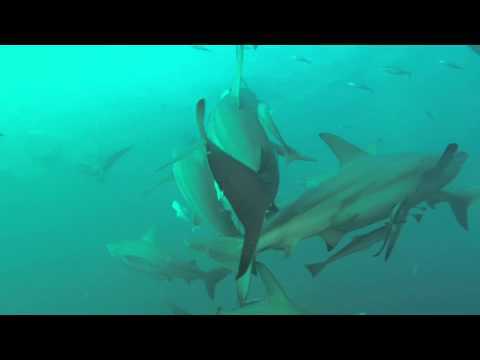 Shark diving in Africa is like diving on steroids…. HOT PRESS: LIQUIDLIFE MAGAZINE COMES TO LIFE! Earlier this week at the Scuba Buddies Brisbane Meet UP night, Tony had the pleasure to meet Liesl Walker, Editor of an exciting new coastal magazine, liquidlifeMAG. From left to right, Tony, Liesl Walker, liquildlifeMag and Fern Perry, Lutwala Dive. liquidlifeMag is the brain child of Liesl Walker and her team of seven other water sport enthusiasts. Their goal is to educate, inspire and entertain locals through stories and photography while also providing information from businesses for everyday people to make use of. Liesel says “I am super excited about this new venture and believe there is definitely a place for it on the Sunshine Coast. We are covering all forms of watersports including fishing, diving and camping as we want liquidlife to be exactly as the name suggests – our Sunny Coast life around liquid!”. liquidlifeMag will be a fresh, new Sunshine Coast glossy magazine with four editions each year with 10,000 free copies distributed to cafes, shops, restaurants and hotels from Caloundra to Noosa at the start of each season. Their first magazine will be issued as a Spring Edition to be released on the 1st September 2014. They would love to hear from any individuals with interesting watersport stories or local businesses who would like to promote their products and services. Find out more on their web site: www.liquidlifemag.com.au or on their Facebook page: liquidlife MAG. 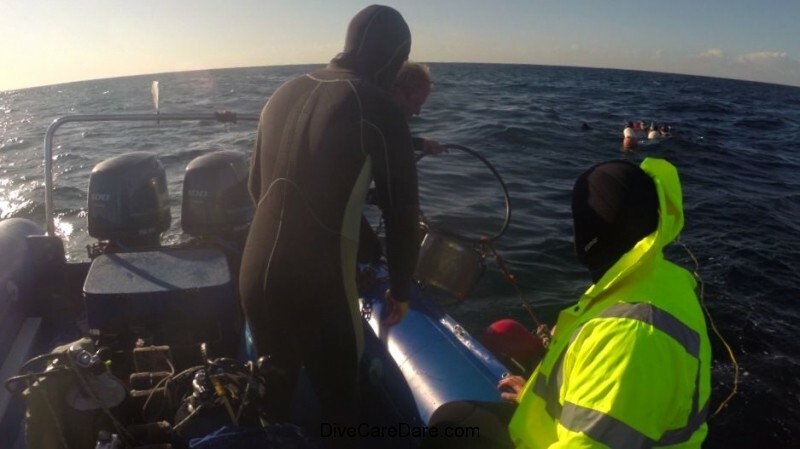 DiveCareDare was launched on the 1st July 2014. 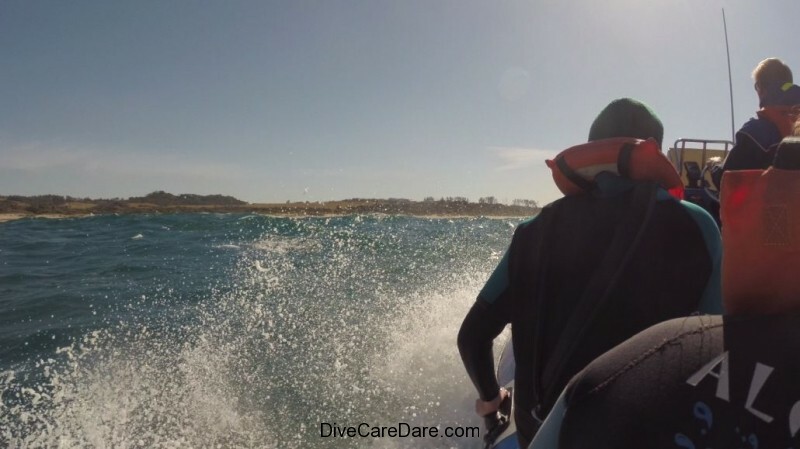 DiveCareDare is the brain child of Tony Isaacson, a PADI scuba instructor, marine studies teacher, naturalist and marine adventurer for 30 years. Tony has been passionate about marine life and the oceans to the extent that his “life is diving….the rest is surface interval”. Since 1977 his passion has been delivered to students from preschool to post graduates and marine educational associations and clubs. Now he has stepped up to a dot-com to engage a global interaction with like-minded educators, adventurers ocean care volunteers and those who know that an ocean without sharks is a scarier world than one with them. Three words that can mean many things. 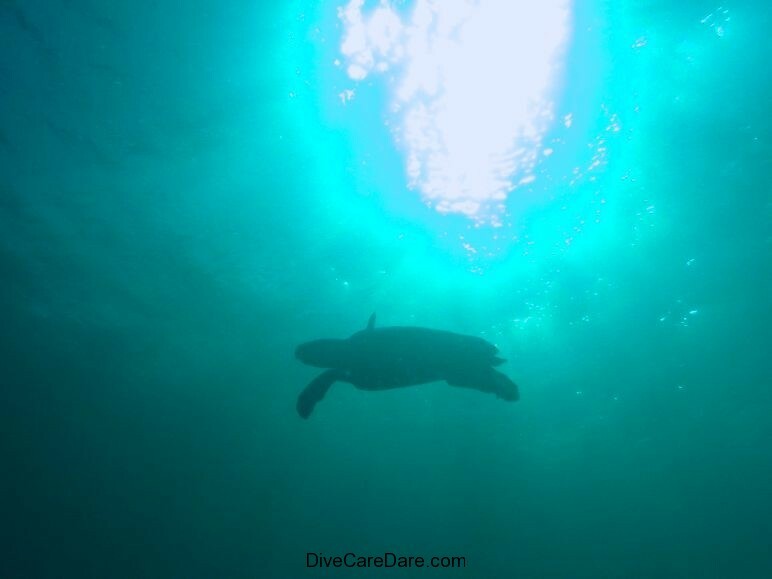 Whatever you believe it to be, DiveCareDare is an educational platform for scuba divers, snorkelers, naturalists and those interested in learning more about diving destinations around the world and how they can help to make a difference for the creatures that live there. The welfare of sharks is of particular interest and concern for Tony. To overcome a lifelong fear of sharks Tony has turned to the finest locations on the planet to get to know sharks and to respect them and their pivotal role for healthy sustainable oceans. Tony waves the flag for sharks and marine ecotourism around the world. He has site custodial roles with the Grey Nurse Shark Watch to monitor the recovery of a shark which has been reduced to critically low numbers because they looked ferocious to a generation affected by the 1975 blockbuster movie JAWS. In 2013 Tony motivated a 60 MINUTES team including well known reporter Peter Overton and bull shark bite survivor Paul de Gelder to dive with bull sharks in Beqa Lagoon, Fiji – the only place in the world where 8 species of shark can be encountered at one dive site. 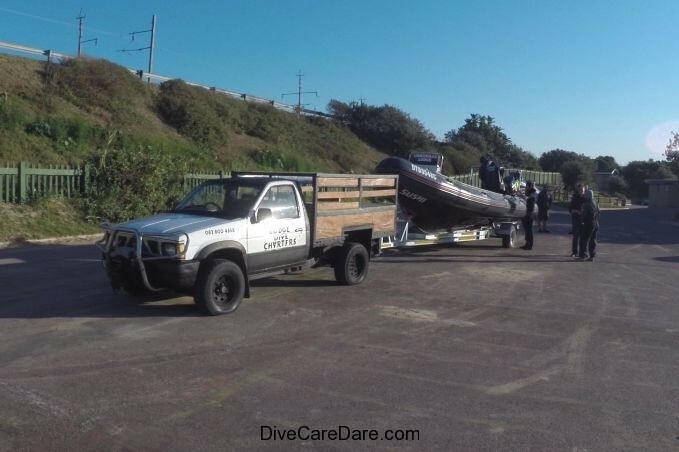 DiveCareDare has connections with dive travel and diver training. 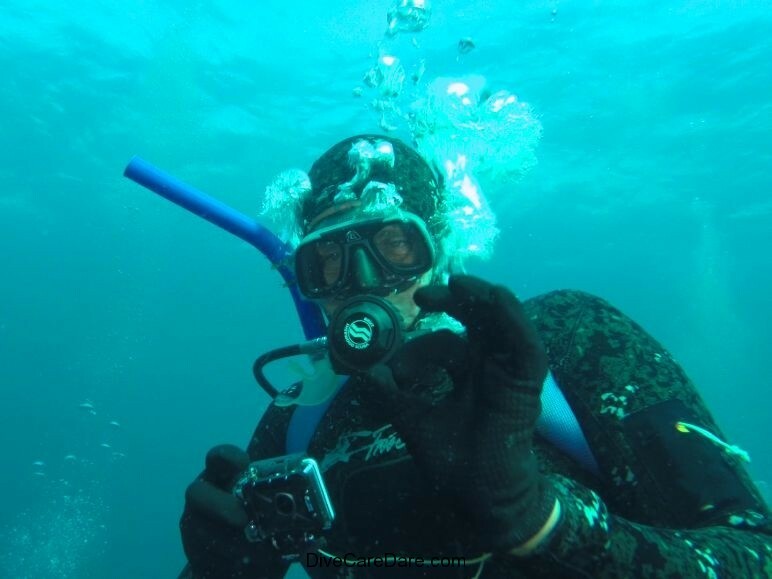 Tony is a certified PADI Instructor and works along with local businesses to provide training for people aspiring to become Open Water and Advanced Divers. He operates an Airbnb “divers lodge” for small groups to do local dives or hit the road for camper van safaris and diving charters north and south of his home on the sunshine Coast. Tony uses videography and frame captures to share what he experiences as a platform for awe, wonder and education. When a fire in our bellies is burning, awareness is heightened and like-minded people can make good things happen for the beasts of this world who cannot speak for themselves. Tony’s mantra fosters intimate human-ocean life interaction. We will understand only what we are taught”. Tony Isaacson is DiveCareDare. DiveCareDare is Tony Isaacson.